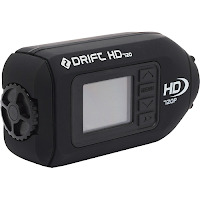 As part of Best Buy's daily deals they are offering this high-end Drift Innovation Action HD Camcorder for just just $80. That's $120 OFF the regular price and includes FREE shipping. Capture all of life's memories in the palm of your hand. I mean that literally - it's 2.2 inches high and 4.2 inches across. The CMOS image sensor snaps amazing detail and clarity, has a 130° rotatable wide-angle lens, and a 4x digital zoom. Strap it to your helmet and race down a hill, film little Timmy's entire softball game, or join the YouTube crowd and tape your cat doing something cute. Click here to view this and other offers at Best Buy.